A friend helped me clean my stove from top to bottom one day. Ever since then, every time I use the oven/broiler, these orange “spots” appear on the top of the stove and on the wall near the stove. They don’t appear right away, but rather several hours later. I’m not sure about when they really appear since I’m usually eating whatever I made and don’t sit there and watch for the spots. To clean the oven, we used a major brand of oven cleaner. It was not an aerosol can, but rather a sponge that had a “reservoir” on top of it. You squeeze the “reservoir” and the oven cleaner goes onto the sponge, and you just wipe it around. 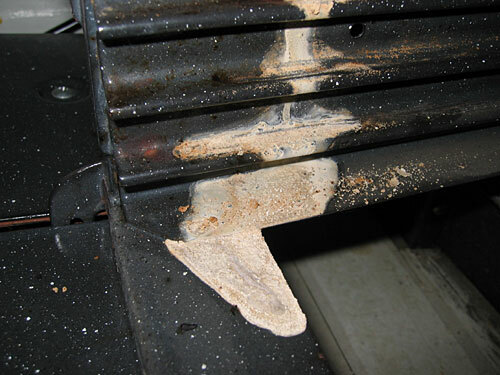 My hypothesis is, with the help of some friends, that we didn’t wipe up all of the oven cleaner (see broiler pictures below), and when using the oven, the leftover oven cleaner heats up and evaporates into the air through the vent. 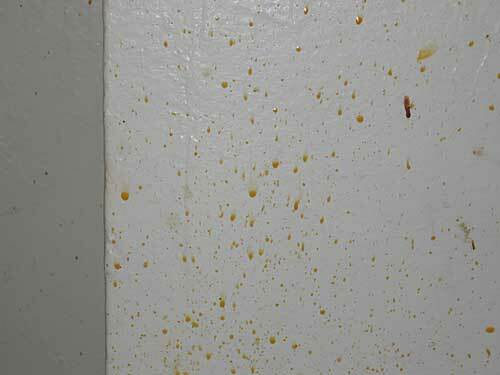 As it cools, it forms these amber colored spots on the top of the oven and on the wall near the oven. Because of convection, these spots predominantly appear on the right side of the vent. These spots are very difficult to get off. It takes very hot water, some abrasive cleanser, and a lot of elbow grease. On the day the below photos were taken, I was planning on cleaning all of the spills on the inside of the oven, but the DEP foiled the plan. There was no hot water that day, and I was too lazy to boil some water since the oven was partially dismantled and I would have to put it back together to boil the water, and then take it apart to clean it. 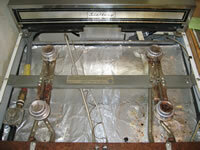 Top of stove with burner pans removed. The middle and right side of stove top have been cleaned several times, while the left side has never been touched. 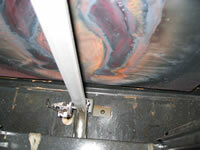 In this photo, the right side had been recently cleaned. Closeup of spots in center of stove top. Notice that some spots are darker in color than others. The darker colored spots also have higher depth than the lighter one's. 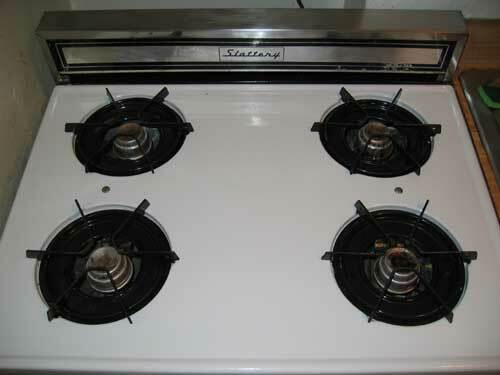 Stove top has been removed. 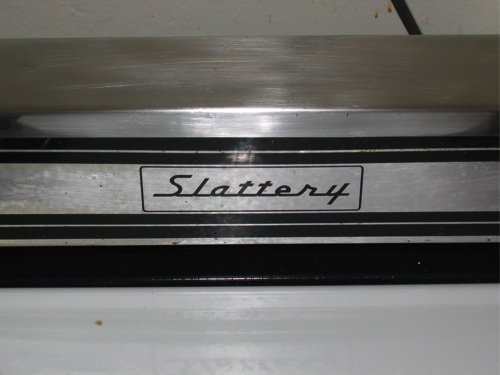 You can see the vent outlet in the middle, just underneath the Slattery logo. 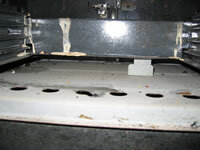 Notice that the spots on the back of the stove are more prevalent on the right than on the left (almost non-existant). Closeup of vent outlet. Again, notice the distribution of spots on the right side of the vent compared to the left. 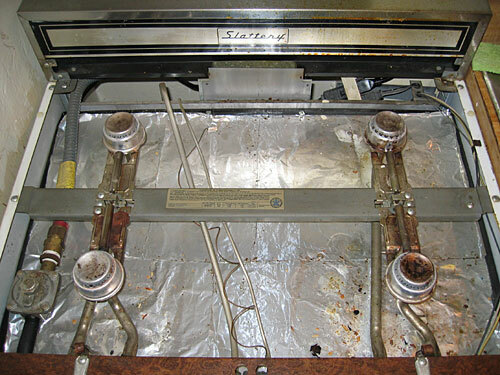 Overview of the top of the stove with the stove top removed. There are no spots on the aluminum foil, which is evidence that the spots are collecting from the air above the stove top. Vent opening from inside the oven section. I checked with my fingers and I could not feel any spots or anything else in there. 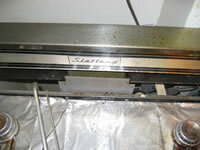 Broiler drawer with sheet pan removed. Notice the three "dripping" spills on the right and left side of the back, and on the left side in the corner. Top of broiler. 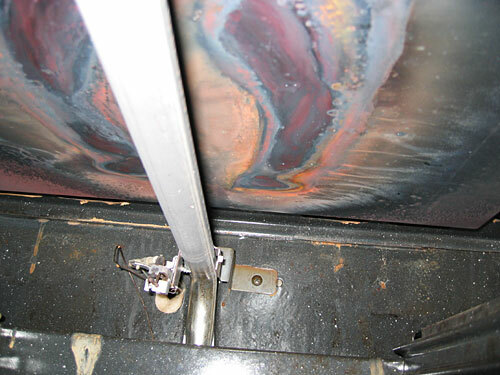 The bar is the heating element. 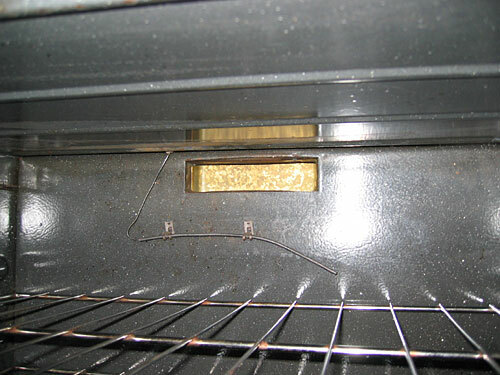 The psychedelic pattern is on the bottom of the oven "chamber". 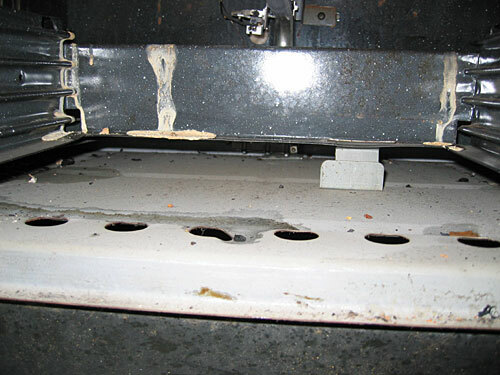 Notice that the back of the oven "chamber" does not make contact with the back of the broiler. My guess is that this small opening leads to the vent. 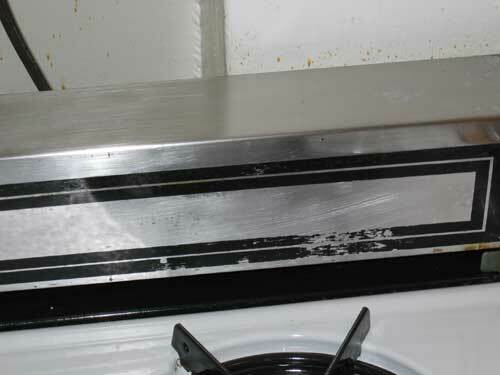 Also note that there is some discoloration on the back of the broiler (on the top and bottom of that "lip") that correspond to the drips on the broiler drawer. 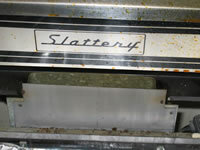 Closeup of "dripping" at the front of the broiler drawer (right side). September 28, 2003 — Finally got around to cleaning the oven today. Got out the Soft Scrub, two Scotch-Brite Rescue pads, some large Playtex gloves (still too small for my hands), and a heap of hot water. After about 45 minutes and two sore arms, it was as clean as it was going to get without completely dismantling the oven. I poured the Soft Scrub onto the stains and gently spread it over all the stains so they all had some Soft Scrub on them. I let it sit like that for about 15 minutes. I then attacked each area with the Scotch-Brite Rescue pads, using a circular motion to get the stains off (wax on, wax off). The stains on the top of the stove disappeared with only a few circles. 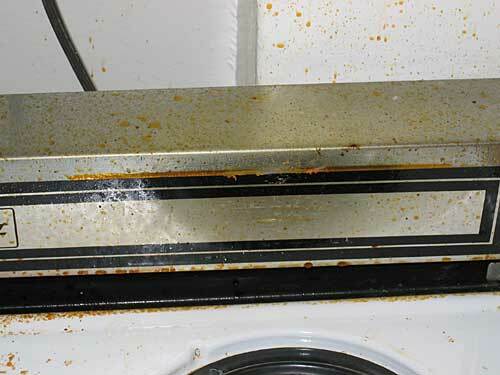 The stains on the back of the stove took a lot more work to get off. 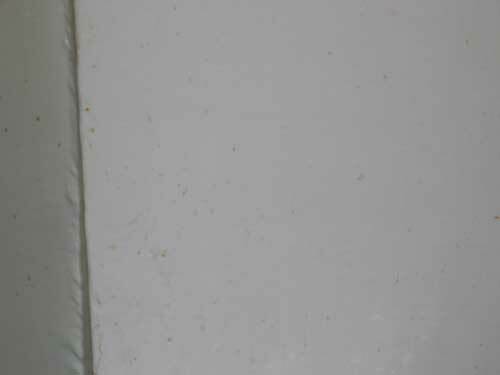 The stains on the wall were almost impossible to get off, taking about 15 minutes of constant scrubbing to get it halfway decent. 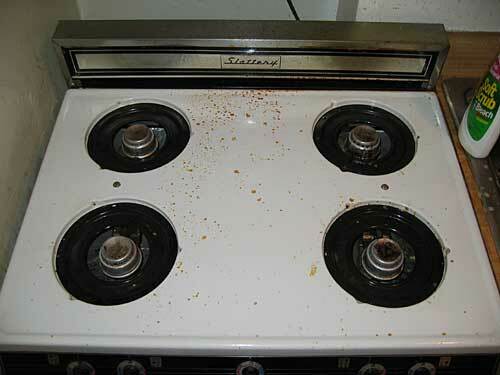 The stove is spotless (except for some dents that were already there). 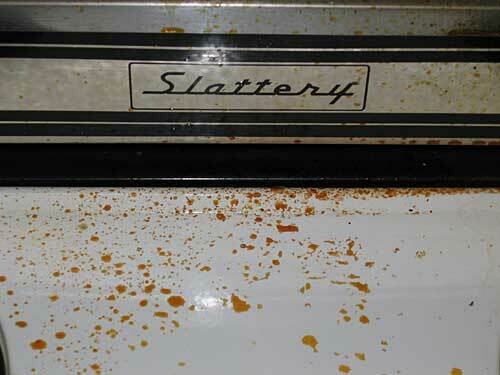 Some of the paint came off during the scrubbing, but the mysterious stains were caked on. The space between the stove and the wall is too tight to get in to. That one spot on the left is actually a ding. I couldn't reach the spots on the wall behind it. The wall is as clean as it is going to get today. My arms were too tired to clean any more. Perhaps another time. October 6, 2003 — On October 2, 2003 I ran an experiment to see if the “alien” spots would come back after one use of the oven. 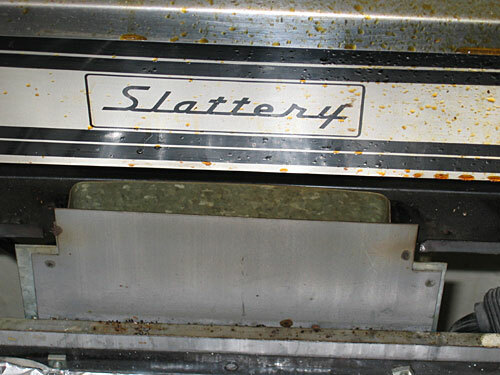 During the experiment, a photograph of the top of the stove was taken every five minutes using an intervalometer so that the results could be examined by a panel of experts. Oven was turned to the “broil” setting at 10:19 p.m. to allow flame to ignite. 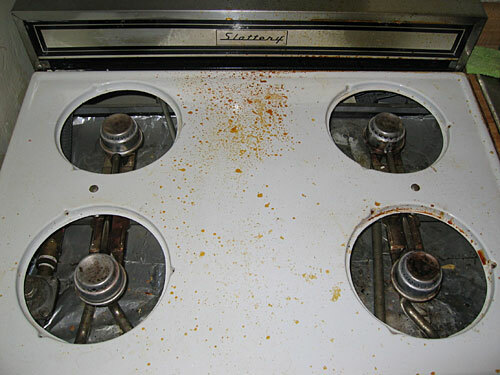 At 10:24 p.m. the oven temperature knob was turned to 350° F.
Oven was run at the previous setting until 11:19 p.m., at which point the knob was turned to the off setting. One hour is about the average time that I use the over for when cooking, assuming about 15-20 minutes to warm up to 350°, then 35-45 minutes of actual cooking. Photography continued until 12:19 a.m. October 3, 2003. After the experiment ended, the top of the stove, the back of the stove and the wall near the stove were examined carefully. The photographs were also carefully examined. The unanimous result was that there were no “alien” spots to be found on any of the surfaces examined. There are two problems with the experiment as it was performed. One, there was no food in the oven during the experiment, and two, there was no cooking utensil in the oven during the experiment. 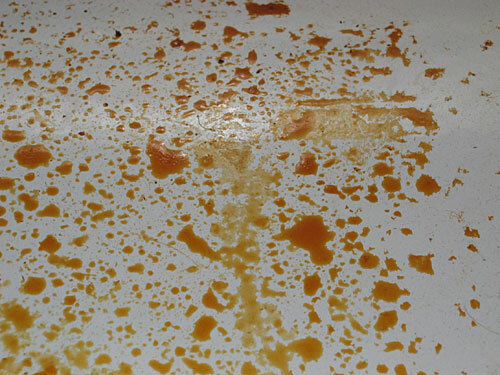 If the “alien” spots are not originating from the suspected source, but rather from some food or a pan that is used in the oven, this would explain why no spots were seen after the experiment ended. I’m not sure another experiment will be run again, but I will be keeping an eye on the stove top after each use, and will update as appropriate. November 4, 2003 — It’s been almost a month since the previous experiment took place. I have used the oven several times since then for all sorts of food preparation (warming up cold pizza, baking cookies, baking potatoes, baking ziti, etc. 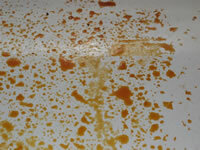 ), and the weird “alien” spots have not come back. I gave the top of the stove a very good once over today, and did not find any spots at all. I guess the good cleaning that I did in late September must have cleaned the root cause of the problem as well. I hope this is the last entry I need to make regarding this problem.